Coal trucks transport coal over Cloud Peak Inc.'s Antelope coal mine in September 2017. The mine has suffered from operational issues in recent months that have contributed to financial difficulties for the organization. Major U.S. coal producers that bit the bullet early and filed for bankruptcy a few years ago are now enjoying the benefits of improved coal markets and clean balance sheets, but the companies that avoided that first wave of reorganizations now find themselves particularly stressed by declining domestic demand. Several smaller companies sought bankruptcy protection as early as 2012, followed by many of the larger publicly held companies in 2015 and 2016. While overall decline in coal demand was responsible for many of the bankruptcies, a debt-fueled acquisition frenzy that ended up being poorly timed as it preceded a collapse in global metallurgical coal prices was a major factor leading to the reorganizations of the largest publicly traded U.S. coal miners. Two companies that illustrate some of the problems faced by the sector today are Westmoreland Coal Co., which just wrapped up a bankruptcy reorganization, and Cloud Peak Energy Inc., which skipped an interest payment on its debt due March 15 while it considers a bankruptcy reorganization. Both companies avoided major acquisitions of metallurgical coal assets, but they also avoided the diversification that is allowing other U.S. coal companies to reap the benefits of improved demand for seaborne metallurgical coal. "Debt loads are certainly playing a part in the financial woes of these two companies, but they also have very narrow business plans that, as it turns out, are not as sustainable as they thought," said Matt Preston, Wood Mackenzie's research director for North American thermal coal markets. Westmoreland's minemouth model — building coal mines near the power plants that need them and securing long-term contracts — proved a detriment when pressure from cheap natural gas and environmental legislation pushed those customers out of the market. 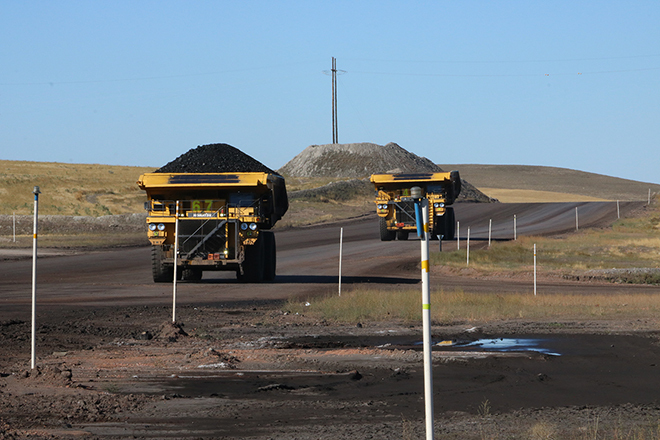 Cloud Peak bet big on the Powder River Basin and its potential as an exporter, which never quite materialized, and a shrinking market for Powder River Basin coal is challenging Cloud Peak's higher-cost operations. Meanwhile, natural gas and renewable energy are cutting into coal's overall share of electricity generation. "You're seeing the bankruptcy of guys who didn't have the benefit of cleaning up their balance sheets earlier," said Joe Aldina, director of U.S. coal research for S&P Global Platts. "Cloud Peak ... didn't make big acquisitions so they've been maligned for not having much of a strategy. I think they had a strategy: to go after the export market. ... Their only lifeline would have been to do an acquisition — people have suggested in the coking coal space — but that would have been pretty high-risk." Competing with companies that restructured debt and reduced costs through bankruptcy reorganization can slow the balancing of supply against reduced demand, a process Murray Energy Corp. CEO Robert Murray described in 2016 as being dragged "down the bankruptcy sewer." Murray Energy, another thermal coal-focused entity that has avoided bankruptcy, produces coal in the less stressed Northern Appalachia and Illinois basins but was recently downgraded by S&P Global Ratings based on its "unsustainable capital structure." Despite some success in placing export tons, Cloud Peak wrote in a March 15 securities filing that logistics export prices have declined to uneconomic levels. Larger competitors in the basin, Arch Coal Inc. and Peabody Energy Corp., recently lowered coal production guidance from the region for 2019, but both have exposure to higher-margin metallurgical coal elsewhere and the market for it is healthy. Increased exports have helped disguise a secular decline in domestic demand for coal that has continued despite President Donald Trump's attempts to boost the coal sector's prospects. "Utility companies ... are dealing from a newly powerful position in which they operate with less dependence on coal — and from a position that regards coal-fired power as increasingly untenable," said a March 18 report from the Institute for Energy Economics and Financial Analysis. "Without the robust customer base it had for generations, the U.S. coal industry — the [Powder River Basin] segment of that industry included — cannot continue along a business-as-usual path." Cloud Peak's mines could be a tough sell as the company assesses its business strategy, particularly given recent operational issues. The mines' location and costs make it difficult to compete with other U.S. coal producers, many of which either mine a higher-quality product or can mine and deliver coal more cheaply. "We do not foresee a buyer of the company's assets emerging at this point," wrote Seaport Global Securities LLC analyst Mark Levin in a March 15 note. "Notably, we think Cloud Peak may already be ceding market share to Arch and Peabody as customers are well aware of the company's troubles." S&P Global Platts, S&P Global Ratings and S&P Global Market Intelligence are owned by S&P Global Inc.